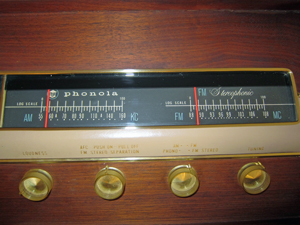 My wife found this Phonola 3062-A Stereo Console in a local thrift shop in the Spring of 2012. We were looking for a headboard for our bedroom on a Sunday afternoon and she called me over to the area where they kept the furniture and said "Check this out!" She lifted the right top cabinet panel to show me what she found. We'd had enough experience in thrift shops and garage sales to figure that this unit would be broken to some degree, so when we asked if we could plug it in our expectations were low. (The staff in the store didn't know what my wife was talking about when she asked if they could plug in the stereo in the middle of the store-- they had no idea what this was.) 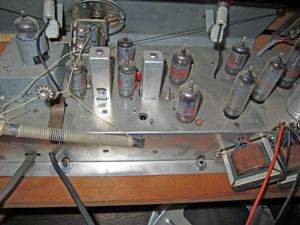 Once powered up, the unit started to boom music through its speakers. There was a little crackling when I adjusted the controls because they were dirty, but it sounded great. The best moment came when a young employee of the store (who was probably about 16) said he'd grab a record to see if the turntable worked. He rushed back with a copy of the 1964 Frank Sinatra/Count Basie LP It Might As Well Be Swing, took it out of the sleeve, looked at it, and said "I don't know what to do with this." I showed him what we used to do in the Old Days and fired up the turntable. It was a little wobbly at first, but soon enough we heard the sounds of "Fly Me To The Moon" wafting through the store. The employee called the whole thing "classy." We paid $35 for the unit and loaded it in our car. It seemed to good to pass up. 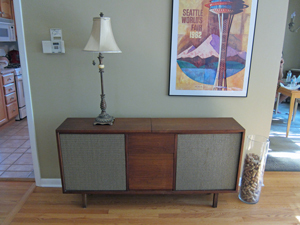 When we got it home I started a Google search for the console. 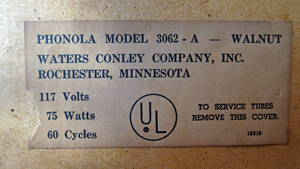 I didn't find too much on Phonola, other than the fact that their products were sold in some department stores and they made product for Sears. Evidently, the company started out by making wind-up phonographs, hence the name. I learned that this unit was probably made around 1962-1963. I removed the back panel and discovered one of the cleanest chassis I'd ever seen. The only problem I saw was that the ferrite antenna's mounting was broken, so I fixed that with a couple of zip ties. Clearly, this console was well cared-for: not only was the inside clean, but the cabinet and grille cloth were almost spotless. A little bit of furniture polish and the cabinet (which appears to be a particle board-laminate composite) looked almost good as new. We decided its new home would be in our living room. 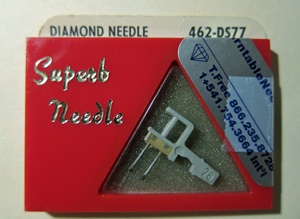 The unit has a selector switch that allows you to choose from Phono/AM/FM/FM Stereo. There's also a manual AFC control for FM, as well as a "Stereo Separation" control that I can't seem to figure out. Volume is controlled by a separate knob from the Power switch. There are also Balance/Treble/Bass controls. 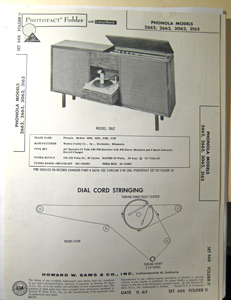 The radio dials are side-by-side and controlled by the same string mechanism. Calibration is a bit off, as you would expect after all these years, but when I connected our outside antenna it seems to pick up FM stations pretty well although some of the more powerful stations seems to splatter across the dial. I've found my favorite way to play this radio is to use the C Crane FM Transmitter and have it tuned to a streaming radio station for the Phonola to pick up. 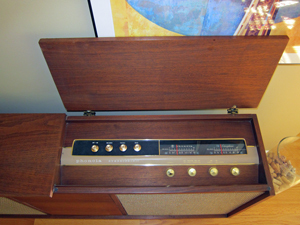 I know that radio purists might think of that as cheating a bit, but it works beautifully. In my searches on the internet I found Sams Photofacts for the unit and a separate one for the turntable, plus I found a new stylus (new old stock) so we could play records. 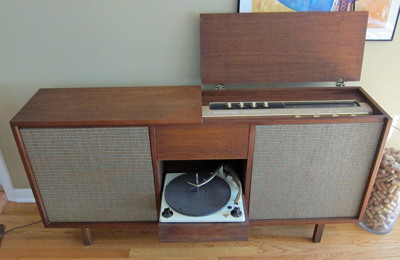 Adding this unit to the collection meant searching the thrift store bins for old vinyl, too. 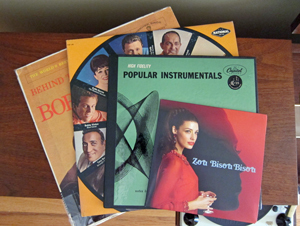 Below you can see some of what we picked up, including: Behind the Button-Down Mind of Bob Newhart (Warner Bros W 1417 - 1961); A Golden Dozen (Columbia Special Products CSP 181, branded in cooperation with National Tea Co., a grocery store chain in the 1960s); High Fidelity Popular Instrumentals in Full Dimensional Sound (10" mono LP, Capitol LAL-9022 - 1954 - Note the "FDS" symbol here means "Full Dimensional Sound" instead of the "Full Dimensional Stereo" we'd all come to see on the Beatles' and Beach Boys' records in the 1960s); and finally, the 21st-Century addition to the collection of Jessica Paré singing "Zou Bisou Bisou" from the TV show Mad Men (Lions Gate Records - LGRMM 501 - 2012). Once again, we learn that keeping your eyes open in thrift shops can be rewarding!